This item includes a kraft card stock favor box with white lace design and white-satin bow placed on top. It measures 2' in. in all dimensions and is sold in sets of 24. Very minimal but easy assembly is required. Love comes in all shapes and sizes. It doesn’t always mean the biggest or the most expensive. Sometimes the most heartfelt gifts are the tiniest ones. 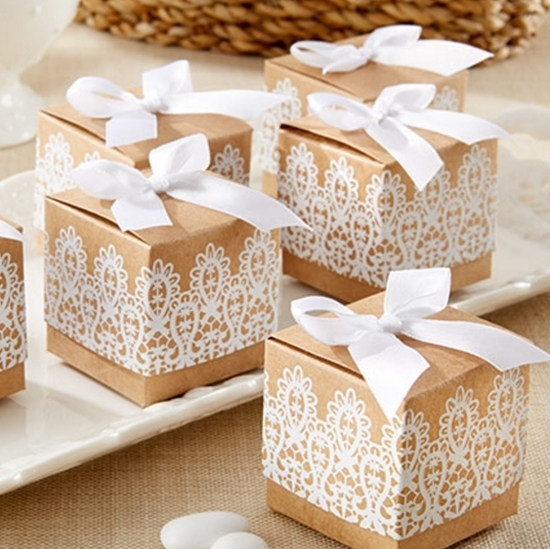 Send your appreciation and love to your guests with our antique inspired favor box. It’s white lace pattern paired with the white satin bow brings a certain romantic, shabby-chic charm to the event. Fill it with mini keepsakes and distribute them to your family and friends for fun all around.